Any information you write on the board lights up and changes with light color. 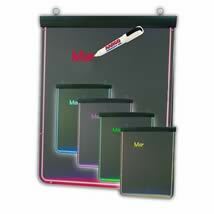 This ultra light lighted markerboard switches from red, blue, purple, green, yellow or alternating colors. The board measures 19" w x 24 1/2"h. The Marker Board includes power supply, hanging hardware, and one marker.